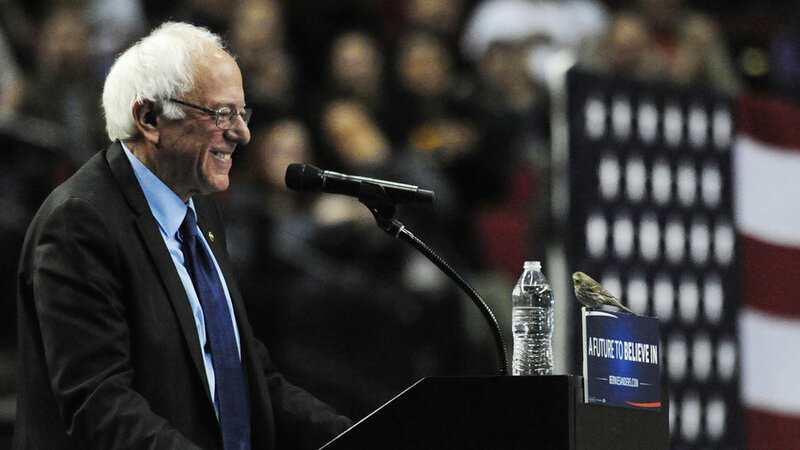 One of the most remarkable, and purely innocent, events during the 2016 presidential race, thus far, was when a small bird landed on Vermont senator Bernie Sander’s podium during a rally in Portland, Oregon. Sanders noticed the bird flying around inside the auditorium and pointed it out, before it perched right before him. The crowd erupted into a wild applause and Bernie couldn’t do anything, but smile at his new little running mate. After a few minutes, Bernie announced that he believed that the bird must be a sign that we should be focusing more on peace in this country and in the world. The video went viral, sparking “Birdie Sanders” memes and more wide discussion on the candidate’s humanity. Meanwhile, Sanders’ political campaign has experienced great success on the Pacific coast. Senator Sanders found incredible support among liberal electorates on the west coast and swept the Alaska, Hawaii, and Washington state Democratic caucuses by earning over 70% of the popular vote in each of the three states. Sanders’ effort to gain as much support as possible in the upcoming primaries to begin to catch up to opponent Hillary Clinton is beginning to pay off, although he has a long way to go. According to an Associated Press analysis, Sanders needs to win over 67 percent of the total remaining delegates and uncommitted superdelegates to take the nomination. Bernie has been touring the Hudson Valley before he reaches New York City, tomorrow April 13th. Bernie spoke in popular college towns, such as the state capital of Albany and Binghamton.Today he will rally in Poughkeepsie, NY at Marist College. Sanders should be able to gather a lot of support throughout his route and remaining events leading to the April 19th New York State primary elections. 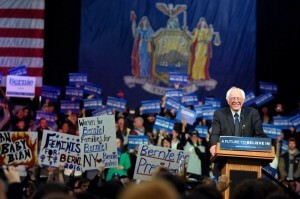 The state of New York, which is home to Sanders, as well as rival Clinton and Republican candidate Donald Trump, is a must-win for the Sanders campaign. Bernie at a rally in Albany. April 11, 2016. Photo Credit to Cindy Schultz.